The Buddha's teaching that there is no soul has absolutely nothing to do with our modern (English) sense of the word "selflessness"; although there are other teachings related to generosity, caring for the sick and poor, and so on, the "no soul" doctrine does not even mean that an ideal Buddhist (like Queen Mallikā, below) would care about others more than herself/himself. As you're about to see, it isn't a doctrine of self-sacrifice, nor of self-abasement. I'm not using my own translation here, but instead directly quoting the (freely-distributed) translation of Bhikkhuni Uppalavanna. [Uppalavanna:] The origin is in Sāvatthi. [Pali:] Tena kho pana samayena rājā pasenadi kosalo mallikāya deviyā saddhiŋ uparipāsādavaragato hoti. Atha kho rājā pasenadi kosalo mallikaŋ deviŋ etadavoca: atthi nu kho te mallike ko cañño attanā piyataroti? [Uppalavanna:] At that time king Pasenadi of Kosala was in the upper storey of [the] palace. Then king Pasenadi of Koslala asked queen Mallika: "Mallika, is there anyone dear to you, more than your self?" [Pali:] Natthi kho me mahārāja ko cañño attanā piyataro. Tuyhaŋ pana mahārāja atthañño koci attanā piyataroti? Mayhampi kho mallike natthañño koci attanā piyataroti. [Uppalavanna:] "Great king, there is no one dear to me, more than my self. Is there anyone dear to you, more than your self?" [He replies:] "Mallika, to me too, there is no one, more dear than my self." [Pali:] Atha kho rājā pasenadi kosalo pāsādā orohitvā yena bhagavā tenupasaṅkami. Upasaṅkamitvā bhagavantaŋ abhivādetvā ekamantaŋ nisīdi. Ekamantaŋ nisinno kho rājā pasenadi kosalo bhagavantaŋ etadavoca: idhāhaŋ bhante mallikāya deviyā saddhiŋ uparipāsādavaragato mallikaŋ deviŋ etadavocaŋ: "atthi nu kho te mallike ko cañño attanā piyataro"-ti. Evaŋ vutte bhante mallikādevī maŋ etadavoca: "natthi kho me mahārāja ko cañño attanā piyataro. Tuyhaŋ pana mahārāja atthañño koci attanā piyataro"ti. Evaŋ vuttāhaŋ bhante mallikaŋ deviŋ etadavocaŋ. "Mayhampi kho mallike natthañño koci attanā piyataro"ti. 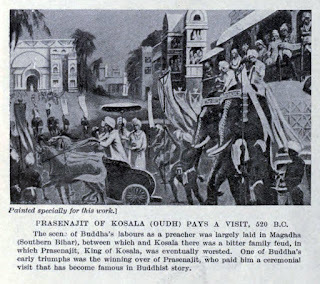 [Uppalavanna:] Then king Pasenadi of Kosala descended from the upper storey of his palace approached the Blessed One [i.e., the Buddha], worshipped, sat on a side and said to the Blessed One: "Venerable sir, I was in the upper storey of the palace with queen Mallika, and I asked her, whether there was anyone dear to her more than her self and she said, great king, there is no one dear to me, more than my self and she aksed me, whether there was anyone dear to me, more than my self. I replied that to me too, there was no one, more dear than my self." [Uppalavanna:] Then the Blessed One knowing the deep meaning, said this stanza that moment. Tasmā na hiŋse paraŋ attakāmoti. Therefore those who love the self should not hurt others." The characters in the dialogue appear a few times in the core canon (and were apparently popular enough to be reinvented in later, post-canonical literature). Mallikā appears in the scriptures as a paragon of Buddhist virtue, whereas her husband is more skeptical, more impious, and he continues to carry out animal sacrifices despite the injunctions of his wife's religion. King Pasenadi ("artist's impression", from Wikipedia). Those who have been reading my articles for some time may expect me to now discuss problems of translation, or to question the meanings of the particular words. I'm not going to do that. In this case, I'm simply going to point out that "the problem of interpretation" is that so many people have selectively disregarded canonical material of this kind entirely. The best translation imaginable won't help anyone, if the evidence is overlooked, and I'm inclined to use someone else's translation whenever my audience is likely to be so shocked by the text as to accuse me of simply making it up. This short passage from the canon will (admittedly) challenge many people's assumptions about what Buddhism "is" (or is supposed to be), and what "no soul" should mean. I've already written long articles dealing with the fact that the Buddhist doctrine of the 12 links of "dependent origination" doesn't say what people pretend it says, and that "breathing meditation" isn't at all what people think it is. Well, now you've got the shortest article possible warning you that the theory of "no soul" isn't what you've been taught to believe it is, either. For many of my readers, the short quotation I've presented above may contradict sermons you've heard from a variety of modern masters, from a variety of traditions (Mahayana and Theravāda alike). For others, it may recall passages that you're familiar with in the Dhammapada. The Dhammapada is one of the few texts that is still widely read, and, notably, "the self" is certainly not used as a dirty word in its verses; on the contrary (just as in the suttanta I've quoted above) we find that a positive value assigned to the self is taught to be reciprocal with the compassion that we're supposed to have for others as, e.g., in the opening of the 10th chapter, the Daṇḍavagga. There's a similar sentiment throughout the 12th chapter (the Attavaggo) where Nārada's translation has a somewhat amusing footnote to clarify that the positive sense of "the self" described here should be understood as only meaning the body, personality, and mind, "or life flux" (i.e., not the soul, as there is no soul, etc.). The same Pali word is used in these positive references to the "self" [atta] that is used elsewhere to fulminate against the existence of the soul. For those of you who have been reading the Dhammapada for many years, this may be a teaching about "the self" that you've had in plain sight, but never considered in reference to "no soul"; they're two sides of the same doctrine. In both the Mallikā-suttanta (above) and in the Dhammapada, the positive value attributed to the self is the basis for having compassion for others; this is (frankly) the exact opposite of Schopenhauer's (all-too-influential) insistence that we have compassion despite the self (by "piercing the illusion of the individual self", etc.). Regrettably, these ideas from 19th century Germany have been more influential than the ancient Buddhist texts in establishing modern assumptions of what Buddhism is supposed to be. To trump one 19th century German philosopher with another, plenty of people reading the suttanta quoted above would think that it had more in common with the philosophy of Max Stirner than it does with Buddhism. Stirner taught that compassion didn't arise from conflating oneself with others, nor from regarding the self as unreal (illusory, etc. ), nor from unifying people in some shared abstraction (be it religious or secular), but instead from accepting one's own "egoism" and appreciating the depth of one's own alienness from others. As you may have guessed, this was less popular than Schopenhauer's transcendental approach to the subject of compassion; in the century that followed, it was also less popular than Stirner's self-appointed nemesis, Karl Marx (who, at the time of Stirner's death, reviled him as the man who wanted to lead all of Europe into a madhouse with his philosophy… an insult that, in retrospect, seems to have been more apt for Marx's Communism). Although Schopenhauer became a powerful, distorting influence on Buddhist studies, there were at least a few western Buddhists who were instead devotees of Max Stirner (including, notably, Alexandra David-Néel). 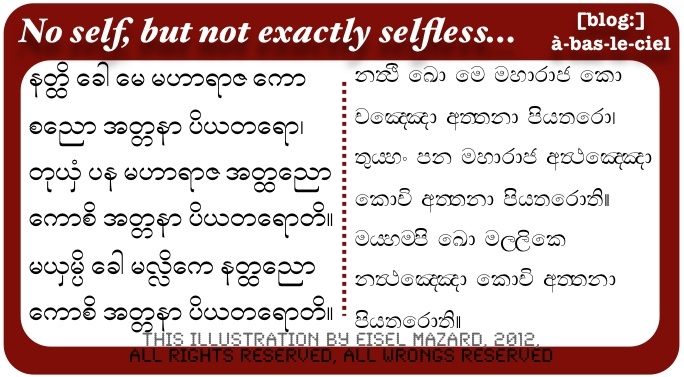 I realize that this discussion will be upsetting for many Buddhists who have been hearing the exact opposite of what the scriptures actually say (about "no self" as "selflessness") over and over again for decades. Please don't attack me for being the one to draw attention to the text here: I didn't write the canon, I'm merely reading it. Based on the evidence of the texts themselves, some of these doctrines were unpopular in ancient India as well. The other sutta briefly mentioned above (the Piyajātika-suttanta) uses the same word for the beloved (piya, translated with the comparative suffix as "more dear", above) to argue that misery arises from regarding others as beloved (with attachment to one's own family providing most of the examples). It is interesting that negative reactions to these sermons have been recorded in the canon at all, given that the Buddhist canon is, understandably, pro-Buddhist in its bias; but the authors evidently thought that the reasons some laypeople and monks stated for rejecting the Buddha's teaching were also important to record. 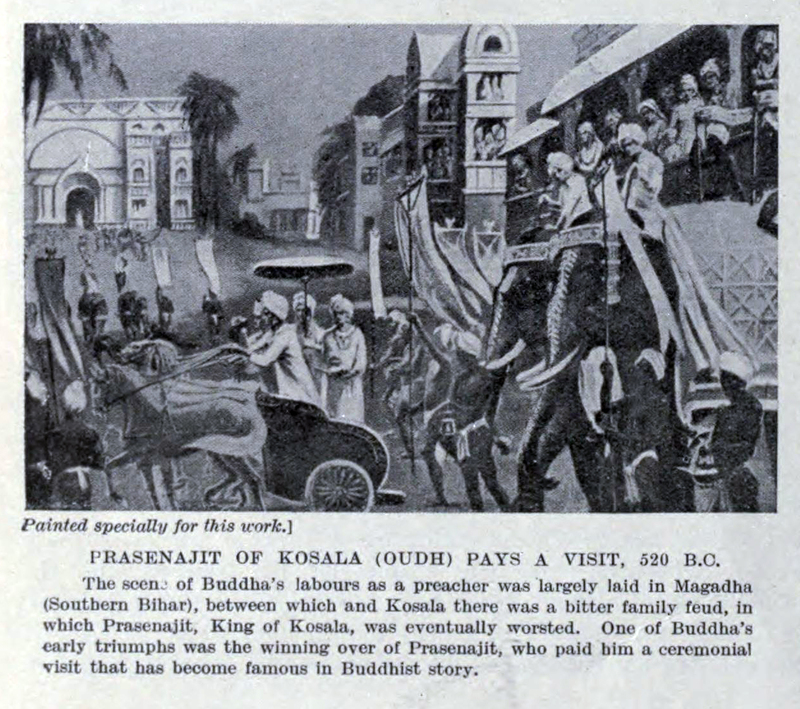 Part of what makes texts like the Piyajātika-suttanta so interesting is that they also show that certain aspects of the Buddha's teaching were shocking to his contemporaries, and that his new religion was rejected outright by some who could have otherwise have been his followers. Even in ancient India, many of these ideas were "a hard sell"; they weren't what a popular audience wanted to hear. Unlike Schopenhauer, Stirner, Marx, or even Socrates, the Buddha's teaching does involve rejecting your own family, including both family obligations and ties of affection; it includes the rejection of both wealth and caste status (be it high or low) in a culture that cared intensely about both, from the cradle to the grave. As is fairly well known in Buddhist studies, the religion's challenge to "filial piety" caused a thousand years of controversy in China, where even shaving your head was considered an offense against your ancestors when Buddhism arrived and started seeking converts. Many modern attempts to reconcile Buddhism with "family values" aren't any more sophisticated than China's struggle of more than a thousand years ago: Buddhism really is an eremitic philosophy, and it really does argue against "family values", and argues for the renunciation of family, caste and clan interests, to take instead a lonely road to a lonesome death. That philosophy was hard to sell in ancient India, and in medieval China, and it's still hard to sell today. In general, the modern doctrine of "selflessness" (interpreting "no soul" as meaning some kind of generosity) is instead bound to some notion of being a good person, while retaining all of your family status and wealth (or even increasing it). The positive value of the self (in the context of the Buddha preaching compassion for others, on the basis of the value one ascribes to oneself) is one important aspect of the doctrinal definition of Buddhism. I'm not presenting my opinion on the matter here, and I'm not discussing a matter of opinion: it is a matter of what the canon plainly says. Perhaps it is because westerners are seeking the esoteric in Buddhist ethics that they're frustrated by the simplicity of what the Buddha actually says on these matters. As we're speaking of compassion, I would invite my readers to imagine (with some compassion) how strange it must be for me to be alive in the 21st century, as one of the only men who can read Pali for himself, and as one of an even smaller number who is willing to let the texts speak for themselves. Unfortunately, I'm aware that my contemporaries are more likely to attack me (with no compassion) for having dared to point this out. Should any religion be so uncomfortable with the bare facts of what its own canon (and its own philosophy) states so plainly?